Naturally, it's worth illustrating how the GX7 compares to its predecessor, the GX1. 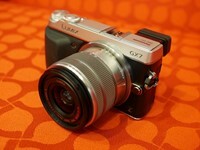 In addition, we'll take a look at how it sizes up next to three competitive mirrorless cameras. The most obvious difference between the GX1 and GX7 is size. The GX7 is significantly larger (not to mention heavier) than its predecessor, which allows it to accommodate the articulating LCD and EVF. The GX7 towers over the GX1, and has a less boxy design. Most of the front elements are in the same place, aside from the AF-assist lamp, which has switched sides. If you exclude protrusions, the GX7 isn't that much thicker than its predecessor. Throw in the EVF and larger (and more comfortable) grip, and the thickness increases quite a bit. 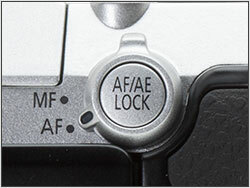 As you can see, the location of the shutter release and mode dial have been swapped, with the GX7 having a control dial around the release button. The most substantial differences between the GX1 and GX7 are found on the back. 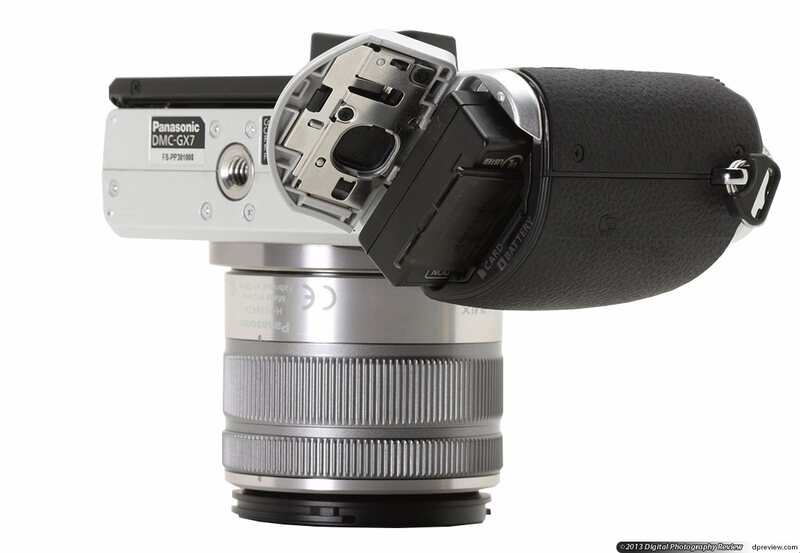 As you can see, the GX7 sports both a tilting LCD and electronic viewfinder. 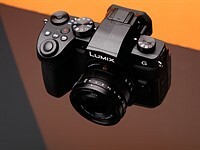 The GX1, on the other hand, has a fixed LCD, and supports an optional EVF via the accessory port you can see on the rear. While the placement of buttons is roughly the same, many of their functions have changed. 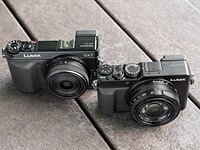 The Lumix GX7 may be a comparatively big camera, but the Fuji X-E1 is even larger, especially with its substantial kit lens attached. The opposite is true when comparing the GX7 with Olympus and Sony's offerings. Three of these four cameras have tilting LCDs, with the X-E1 and NEX-6 also sporting electronic viewfinders. 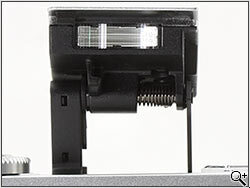 The E-P5 has an optional (and pricey) EVF that attaches to its accessory port. If you want an Olympus mirrorless camera with a built-in EVF, you'll need to step up to one of the OM-D models. In terms of controls, the E-P5 and NEX-6 go for the minimalist approach, while the GX7 and X-E1 have more physical controls. Panasonic nearly ran out of room on the mode dial. In addition to P/A/S/M modes, there's also a 'creative video' mode, three custom spots, scene and 'creative control' modes, and the excellent Intelligent Auto mode. 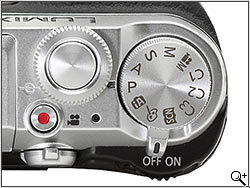 The movie recording button and shutter release / top dial combination can be seen at left. This switch on the back of the camera toggles between auto and manual focus. As you'll see later, you're able to enlarge the frame and use focus peaking when in MF mode. Pressing the button in the middle of the switch will lock focus and exposure (by default - other iterations are available). 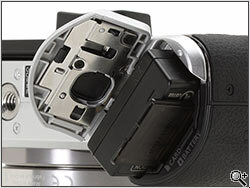 Just under the hot shoe is a button for switching between the LCD and EVF. If you prefer, you can rely on the eye sensor (which offers two sensitivity settings), and have this button handle another task. Just to the right of that is the release for the pop-up flash. The GX7's pop-up flash, which is released manually, has a guide number of 7 meters at ISO 200, which is typical for a camera in this class. This flash can be used to control compatible external flashes wirelessly. There are three ports on the GX7, which are under a plastic cover on its left side. They include USB + composite A/V output, mini HDMI, and an input for a wired remote control. Something that bothered us about these ports is how you get to them. 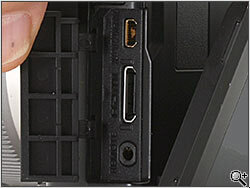 The latch for the door is hidden by the LCD, so you must first tilt it out of the way before you can access the ports. Panasonic cleverly put the battery and SD memory card slot at the bottom of the grip. This gives you easy access to both while the camera is on a tripod. 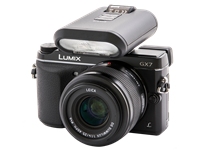 The GX7 uses the 7.4Wh DMW-BLG10 lithium-ion battery, which is also used by the DMC-GF6. 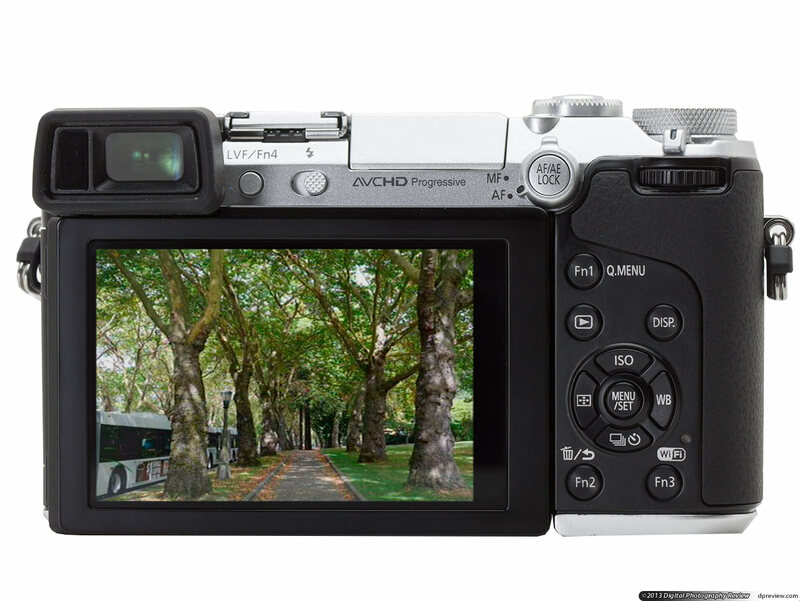 Panasonic lists the battery life as 350 shots per charge when the 14-42mm lens is attached.